What Color Is Vermilion, and What Does It Symbolize? Vermilion (also spelled "vermillion"), which is sometimes referred to as cinnabar, or China or Chinese red, is a tone of rich red with a bit of orange in it, much like scarlet. It can be produced naturally from the mineral cinnabar as well as artificially. 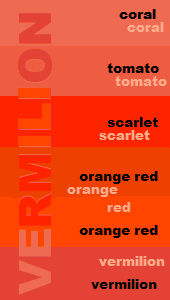 Vermilion is considered the color of life, associated with blood because of the red color, and eternity. It carries with it the same symbolism as red — a power color also associated with love, marriage, and religion. Cinnabar contains mercury, so the mining and creation of cinnabar used to make vermilion pigment was dangerous due to the toxicity of mercury. The hue of the red color depends upon the size of particles of the mercuric sulfides, and the smaller the particles, the brighter and more orange the color. The vermilion color has been widely used throughout history, with the first recognized used of it dating from 7,000 to 8,000 BC. Cinnabar was mined in Spain and used by the ancient Romans, among whom it was a precious and expensive pigment. The Romans used it in cosmetics, frescoes, and other artwork. During the Renaissance, it was used in paintings. Vermilion was also used in ancient China. Cinnabar was mixed with the sap of a tree related to the sumac to create the distinctive red lacquer that gave rise to the alternate name "Chinese red." The resin is toxic, but when painted on wood or metal it hardens. It was used in pottery and ink for calligraphy, and adorned temples and carriages, for example. Married women in India traditionally used vermilion cosmetic powder to color their hair where it parted, a practice known as sindoor. When a woman washed the vermilion powder out of her part, it meant she was a widow. Traditional sindoor made use of turmeric to give the reddish-orange hue, but some commercially produced sindoor powders were made of chemicals. When you plan a design project that will be printed in ink on paper, use CMYK formulations for vermilion in your page layout software or select a Pantone spot color. For display on a computer monitor, use RGB values. 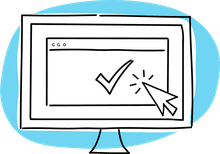 Use hex designations when working with HTML, CSS, and SVG. When working with printed pieces, sometimes a solid color vermilion, rather than a CMYK mix, is a more economical choice. The Pantone Matching System is the most widely recognized spot color system. Here are the Pantone colors suggested as best matches to vermilion colors.